I am a geophysicist for Stone Energy in Lafayette, LA, and own the only Tiger in town, which is lots of fun, but makes restoration and maintenance a challenge. Obtained my Mk I B9473298, in 1997, having owned a new Series V Alpine as a teenager, 30 years earlier. 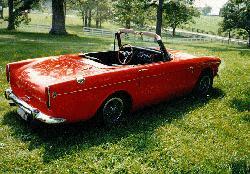 My Tiger was owned by a gentleman in Ohio, who unfortunately died while the car was undergoing restoration. The car sat repainted, but unassembled for about 10 years. Finally, Ian Spencer, of the Alpine website fame, purchased the car from the estate and reassembled it with the aid of Doug Jennings. 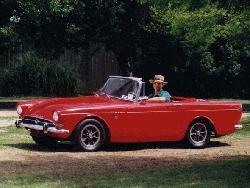 Ian preferred Alpines, so he sold the Tiger to a gentleman in Kentucky, who ultimately sold the car to me. B9473298 is a number-matching model, and is mostly stock in appearance, but sports a 289 (the original 260 is on an engine stand) and wide-ratio gears.